The end of the year is a great time to hand out business collateral; t-shirts and sweatshirts included. We had the privilege of creating these threads for a great client of ours. 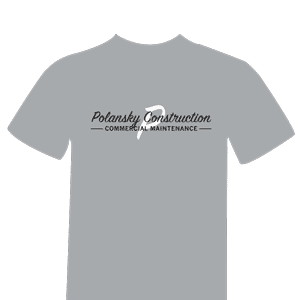 Polansky Construction is a commercial maintenance company and we have seen first hand they can, and will, do just about anything to help maintain your business. Keep them in mind for all of your commercial maintenance needs. Keep us in mind for all of your apparel needs!